The Houston Congressman has filed articles of impeachment against President Donald Trump. After months of demands from many rank-and-file Democrats to impeach the president, formal articles of impeachment have been filed against President Donald J. Trump. The resolution, field by Rep. Al Green (D-Houston), cites four reasons for impeachment, ranging from incitement of bigotry and racism, to falsely accusing opponents of voter fraud. But Green’s Democratic colleagues on Capitol Hill have not lined up to support his resolution. What happened to the furor of just a few months ago, with people taking to the streets, demanding that elected members of Congress hold the president accountable? Mike DeBonis, who covers Congress for the Washington Post says Green’s articles of impeachment came very close to getting a House vote, much to the chagrin of fellow Democrats, who don’t want to engage in an impeachment fight right now. DeBonis says that after bringing the resolution to the House floor, Green “disappeared,” and did not put the resolution forward. But the leadership of the House, both Democratic and Republican, weren’t interested, DeBonis says. Though Democrats may be sympathetic to Green’s views of the president, DeBonis says they have no interest in trying to impeach him, at least not now. DeBonis says Democratic leaders are content to allow ongoing investigations of the president and his associates to proceed. Texas Standard reached out to Rep. Green, but we were not able to arrange an interview. Without Its Storied Principal, What’s The Future Of Furr High? Does UNESCO Withdrawal Threaten The Missions’ World Heritage Designation? More Texas Inmates Are Getting High School Diplomas in Prison. Here’s How. 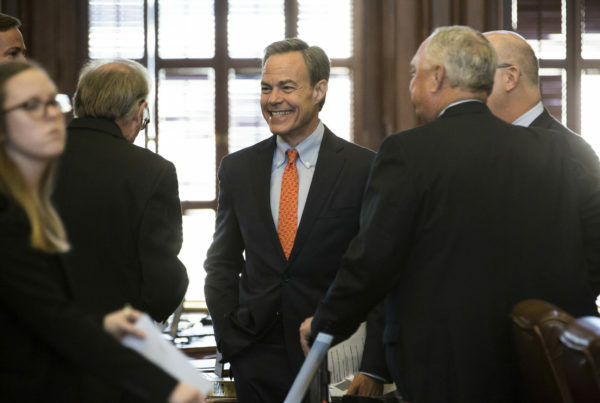 Is Joe Straus Prepping For Future Showdowns At The Capitol?